This is a Polish vodka called Zubrowka and is a dry herb flavored vodka distilled from rye. The spirit is mixed with a small addition of Hierochloe odorata, also known as Bison Grass. The grass grows in portions of Poland and Blearus. Each bottle has a decorative blade of bison grass in the bottle, but it does not add anything to the drink. Bison grass contains a toxic compound coumarin which is prohibited by the FDA and thus caused the drink to be banned in 1978 to the US. By nurtalizing the comound and making Bison Grass Vodka coumarin- free, the US is now able to bring the flavor of Bison grass vodka back. We found this bottle in Cleveland, OH. I have not seen it anywhere else yet. We drank it neat and on ice. I was surprised by the flavors. Vanilla and fresh cut grass was the dominate flavor. Coconut and almond came through in the finish. I am not a lover of flavored sprits, but this is so unique that it should be tried if you can find it. I assume the green color is an artificial coloring agent. Some believe bison grass contains an aphrodesiac....perhaps...give it a try and tell me what you think. 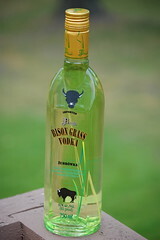 Traditionally, the bison grass vodka is mixed with apple juice, a drink known in Poland as Tatanka and in Britian as a Frisky Bison. Older-school zubrowky in my experience have a faint brown tint so, yeah, safe to say that green is an added color. Where's that one from? Poland? I've seen some from Ukraine in the past few years. Not sure about your neck of the woods, but down in Hallandale and thereabouts, there are a few Slav-owned stores that carry decent selections of zubrowka and other less common flavored vodkas, as well as other Eastern European intoxicants like slivovica, rakija, &c.
Cool blog as for me. It would be great to read more about that topic. Thnx for sharing this data. article like yours. It's pretty worth enough for me. In my opinion, if all web owners and bloggers made good content as you did, the net will be much more useful than ever before. What's up to every one, it's truly a fastidious for me to pay a quick visit this website, it contains helpful Information. Nevertheless think of if you added some great pictures or videos to give your posts more, "pop"!